DC motor is the most used motor in Robotics and electronics projects. For controlling the speed of DC motor we have various methods, but in this project we are controlling DC Motor speed using PWM. In this project we will be able to control the speed of DC motor with potentiometer and we can adjust the speed by rotating the knob of Potentiometer. Now if the switch in the figure is closed continuously over a period of time then the motor will continuously ON during that time. If the switch is closed for 8ms and opened for 2ms over a cycle of 10ms, then the Motor will be ON only in the 8ms time. Now the average terminal over across the over a period of 10ms = Turn ON time/ (Turn ON time + Turn OFF time), this is called duty cycle and is of 80% (8/ (8+2)), so the average output voltage will be 80% of the battery voltage. Now human eye cannot see that motor is on for 8ms and off for 2ms, so will look like DC Motor is rotating with 80% speed. 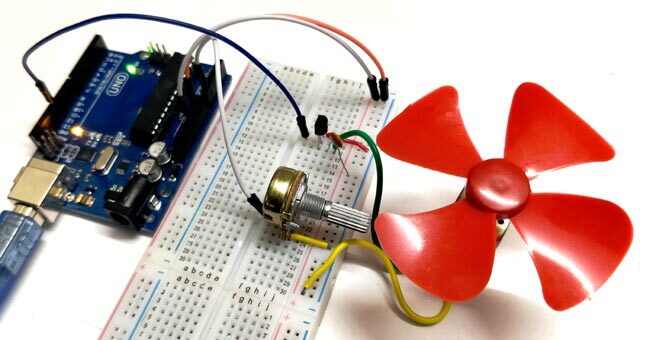 The complete Arduino code for controlling DC motor speed using potentiometer is given at the end. In the below code, we have initialized the variable c1 and c2 and assigned analog pin A0 for the potentiometer output and 12th Pin for ‘pwm’. Now, in the below code, setting pin A0 as input and 12 (which is PWM pin) as output. Now, in void loop (), we are reading the analog value (from A0) using analogRead(pot), and saving it to variable c2. Then, subtract c2 value from 1024 and save the result in c1. Then make the PWM pin 12th of Arduino HIGH and then after a delay of value c1 make that pin LOW. Again, after a delay of value c2 the loop continues. The reason for subtracting Analog value from 1024 is, the Arduino Uno ADC is of 10-bit resolution (so the integer values from 0 - 2^10 = 1024 values). This means that it will map input voltages between 0 and 5 volts into integer values between 0 and 1024. So if we multiply input anlogValue to (5/1024), then we get the digital value of input voltage. Learn here how to use ADC input in Arduino. In this circuit, for controlling the speed of DC motor, we use a 100K ohm potentiometer to change the duty cycle of the PWM signal. 100K ohm potentiometer is connected to the analog input pin A0 of the Arduino UNO and the DC motor is connected to the 12th pin of the Arduino (which is the PWM pin). The working of Arduino program is very simple, as it reads the voltage from the analog pin A0. The voltage at analog pin is varied by using the potentiometer. After doing some necessary calculation the duty cycle is adjusted according to it. For example, if we feed 256 value to the analog input, then the HIGH time will be 768ms (1024-256) and LOW time will be 256ms. Therefore, it simply means the duty cycle is 75%. Our eyes cannot see such high frequency oscillation and it looks like motor is continuously ON with 75% of speed. So that’s how we can control the speed using Potentiometer.